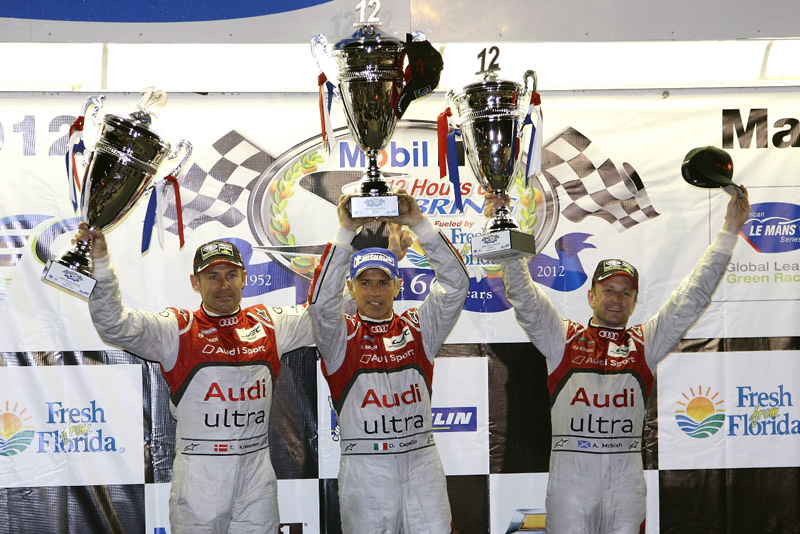 On the eve of Audi R18 TDI’s farewell, Audi bagged in victory at FIA World Endurance Championship (WEC). 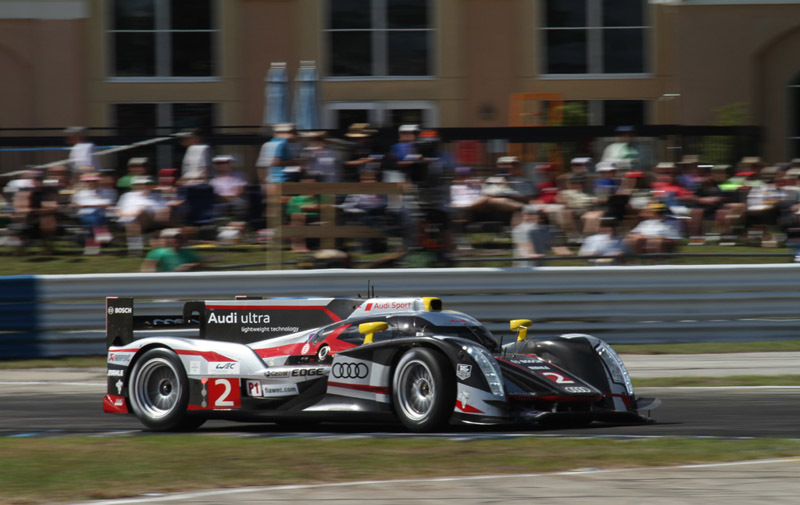 Behind the wheels of Audi R18 TDI were racers Dindo Capello, Tom Kristensen and Allan McNish, who celebrated the tenth overall success of Audi at the famous Sebring 12 Hours in the U.S. state of Florida. Audi’s new investment, Loic Duval completed Audi’s one-two victory together with his team-mates Timo Bernhard and Romain Dumas. The race was interrupted by 11 caution periods, with Capello, Kristensen & McNish behind the wheels of the Audi R18 TDI remarked as car number ‘2’, had to struggle for their victory. Rivals of the same team were in car remarked ‘3’, who kept chasing the car number 2, with seconds gap during the first 10 hours of the 12 hours race. Thanks to the safety car, the gap kept diminishing during caution periods at the front, however Bernhard, Dumas & Duval lost four laps shortly before the end of the race, due to body contact with another team’s car. 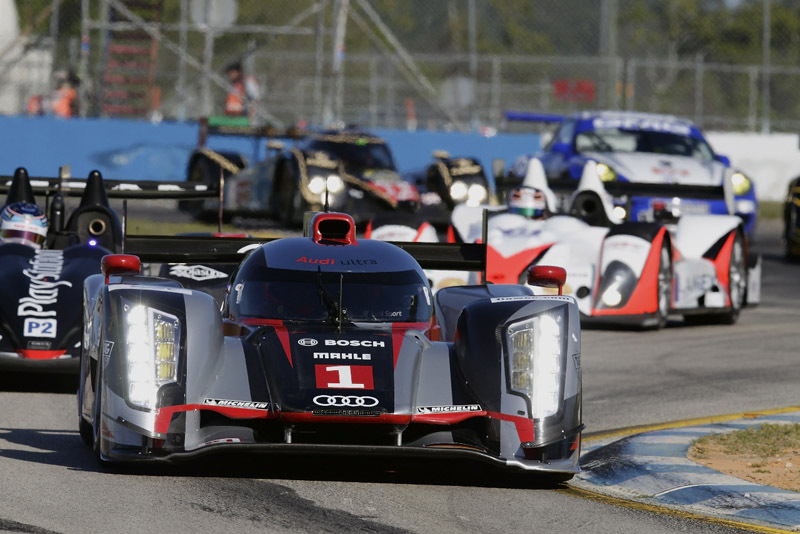 On the other end, Audi Sport Team Joest used great strategy to dodge through the opponents. The squad set alternating pit stop intervals for its two best Audi R18 TDI cars, which consistently kept their quickest rivals from HPD-Honda one lap behind the two diesel-powered sports cars. Throughout the race, there was heavy traffic on the track, and spectators also witnessed several accidents. However, the R18 TDI managed to cross the finish line without any significant damage. 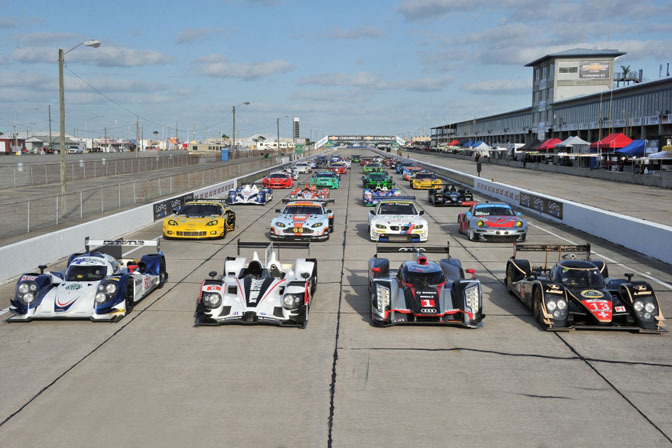 Moreover, it is not only marked as the tenth Audi victory at the 60th anniversary run of the Sebring 12 hours a milestone, but also for drivers Tom Kristensen and Allan McNish as they celebrated sixth and fifth personal success at the classic race in Florida, Dindo Capello. Three years before, the trio had clinched Audi’s last victory to date. There was a great chance for the third R18 TDI to finish lead. André Lotterer, who managed to bag in the first pole position in the new FIA World Endurance Championship qualifying for Audi, teamed up with Benoît Tréluyer and Marcel Fässler, and gave tough fight to finish to the winning Audis. Sadly though, the car number ‘1’ lost 17 laps due to some defective electrical shifting unit on the transmission, forcing the team to plan out an unscheduled repair in the pit. In the end, the three-time Le Mans winners from last year finished in 16th place overall and fifth in the LMP1 category of the WEC classification. The Audi R18 TDI gave a spectacular performance in the presence of Jean Todt, the President of the FIA, delivering its successful farewell performance at Sebring. It was a chance for the world to see the successful technology future Audi cars will be running on. On the fringes of the event, Audi showcased the new R18 e-tron quattro, which like the new R18 ultra will be fielded for the second WEC round on May 5 at Spa (Belgium). A week before, the new Audi A5 DTM will also be making its eagerly awaited debut at Hockenheimring. Ralf Jüttner, Technical Director Audi Sport Team Joest, said, “That was a pretty strenuous race. And our rivals were really close on our heels. They were a tiny bit slower than we but in the caution period they wouldn’t ease up on us. They only started having problems in the end. Those were eleven hours of hard work for us. Well done to Dindo (Capello), Tom (Kristensen) and Allan (McNish). It was a superb drive. Fortunately, we made believers out of all those who thought we’d forgotten how to drive cars. Congratulations, too, to the drivers of the other two cars.